MYTH: Not everyone with a developmental disability is appropriate for Supported Living Services. FACT: The eligibility criteria for Supported Living Services (SLS) requires that an individual be 18 years old and able to express, either directly or through an advocate, an interest in living in his/her own place. SLS should be discussed in the IPP process, and included in the person's IPP. Supported Living Services Regulations specify that a person must live in a home that is not the place of residence of a parent or conservator of the consumer. Most importantly, according to the Regulations, people receiving supports shall not be denied eligibility for SLS solely because of the nature and severity of their disabilities. Supports and services are designed around the individual needs and preferences of the person. If a person needs 24 hour support, then that is what is built into the support plan. MYTH: Some people are not ready for Supported Living Services. FACT: Readiness is an archaic way of looking at services in this day and age. It is steeped in the developmental model of service delivery while Supported Living Services are based on a Person Centered model. People do not earn their way into Supported Living Services, nor is it something that they graduate into. Supports are designed around a person's needs; if a person cannot yet do something which members of his/her circle of support believe is important to be able to do, then assistance is provided and goals and objectives around this need can be developed. There are some things that an individual may never be able to do independently and that is OK. SLS providers understand that interdependence is a reasonable goal or expectation for many of the people that they support. MYTH: People receiving Supported Living Services get unreasonably high-cost services. FACT: Costs for SLS vary greatly across the state, and from one regional center to another. This is often the result of a widely divergent interpretations of the definition of Supported Living Services. Some regional centers have strict limits on what they are willing to provide in the way of individualized services to people within their own homes. In some areas, there is little difference between Supported Living Services and Independent Living Services. Therefore, the costs will look similar for these two types of support. Some regional centers are committed to the provision of quality, individualized supports designed to meet a person's needs while assuring that safety is a priority. Real costs range from $2,500 to over $20,000 per month. While rare, the higher dollar amounts reflect the needs of persons with multiple, complex support issues, whose necessary services will be higher cost in any setting. The average cost for the majority of participants is many thousands of dollars less than the average cost of services in one of California’s Developmental Centers. MYTH: Some people receiving Supported Living Services have been able to get the state to pay for things which are clearly luxuries and not available to others -- such as swimming pools. FACT: Ah, the infamous swimming pool! DDS reports that the swimming pool of notorious report (note singular) was not built for someone receiving Supported Living Services. There have been occasions when SLS participants have received additional funding for a piece of medical equipment or for accessibility adaptations, but there is no evidence or data that SLS has a pattern of extravagant expenditures. MYTH: If someone wants Supported Living Services, he/she must have a paid roommate. FACT: It is true that Supported Living arrangements erred on the side of caution when the concept was new. Everyone wanted to ensure safety for the participants and the temptation to set up the maximum level of support and supervision, regardless of a person's real needs, was overwhelming. Today, however, there are many different configurations of support, and the service has truly begun to reflect the unique needs of its many participants. Many factors are considered in developing a plan of support. A person's own preferences, budget, choices and needs are primary, but other concerns or issues are also taken into consideration, such as the availability of generic resources, IHSS hours, family involvement, employment or day activities of the individual, medical or health needs -- the list is extensive. MYTH: People who live with their families or in a low-cost residential program such as a Level 2 group home are ineligible for Supported Living. FACT: Based on a strict interpretation of early draft Supported Living Services Regulations, many regional centers interpreted cost-effectiveness, or cost cap language, in a way that presumed that Supported Living could not cost more than the service being provided at the time of referral. Some people interpreted this to mean that persons who were receiving no services or very low-cost services would not be eligible for higher cost SLS services. This has been successfully challenged as incompatible with the provisions of the Lanterman Act, though some regional centers continue to use it to keep SLS costs artificially low. MYTH: A person using Supported Living Services is expected to have supports reduced eventually to Independent Living Service levels. FACT: Though the level of support is not required to decrease, it is true that this happens for some people. Supports are designed to be flexible and may decrease or increase as individual needs change. As a person and their SLS provider work to maximize generic resources, their support hours or costs may decrease. As a person learns new skills, he/she may require less support. For some people, the need for supports may never change much from year to year. However, it is also true that many factors might require that supports be increased, such as a deteriorating medical condition, aging, or an increased need for medication or behavioral support. Because developmental disabilities, by their very definition, are lifelong disabilities, it is reasonable to assume that some level of support will be required on an ongoing basis. MYTH: Supported Living Services are available only to those who advocate strongly for themselves. FACT: It is true that in our field, like many others, “the squeaky wheel gets the grease.” Because so many other stakeholders in the system subscribe to one or more of the MYTHS that plague Supported Living Services, it is sometimes difficult to convince key people that it is the most appropriate living arrangement for an individual. 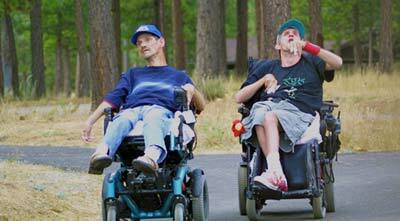 It is also not uncommon to hear that people were not aware of Supported Living as an option. Today, many of the people who use Supported Living Services require some sort of assistance in communication. They may not have been the strongest self-advocates when they were first referred, but they have learned to speak up and out! Many people who receive services do not speak at all, but they have families or other advocates who have been instrumental in helping them access Supported Living Services. Until it is required that people are given a full range of their options before choosing a support model, it will not be a fair process. MYTH: People in Supported Living Services are at greater risk of isolation, loneliness, and victimization than their counterparts in restrictive residential settings due to a lack of supervision and support. FACT: Supported Living Services are delivered to one person at a time. The individual attention that participants receive exceeds anything available in traditional residential placements that, necessarily, must focus on the needs of a group. The focus in SLS arrangements is on the choices and needs of one individual, and services, supports and training are tailored to that person. Living in the community comes with a certain degree of risk, but a good supported living agency recognizes that they have a responsibility to find the balance between risk and opportunity, providing an appropriate safety net when necessary. Supported living providers also have a responsibility for implementing 24-hour emergency response plans for each individual. If the circle of support around the individual does not work at creating opportunities and developing natural supports, or does not strive to build community connections, a person could become isolated. It is critical therefore, that the team around a participant works to design supports which will increase community membership and participation, as well as to build and/or strengthen the person's circle of support. MYTH: The most cost-effective way for people to live in SLS arrangements is for providers to purchase property and rent it to the individuals they support. FACT: According to the SLS Regulations, providers of services may not also control the property in which a person lives. The individual using SLS must have control of his/her own home; in fact, the primary reason that the SLS Regulations require a person to be 18 years of age in order to use SLS is that 18 is the minimum age in California that one can legally enter into a contract (i.e. lease, rental agreement or sales contract). The individual having control of his/her home, and the separation of services from control of the home, is one of the hallmarks of supported living, and a major difference from other support models. Whether the provider is an agency, parent or other individual, the SLS Regulations state that SLS vendor shall have no financial or fiduciary involvement in the home, or in any utility or service contract integral to the occupancy of the home, of a consumer to whom the SLS vendor provides services. While the Regulations do provide a process for exceptions, there is an inherent danger in one party having sole control of both the person's home and services, even when the original intent is good. Experienced SLS providers, even in geographic areas that have high costs of living, have been successful in developing and implementing creative strategies to avoid a fiduciary involvement in the homes of people receiving supports, thereby ensuring as much as is possible that individuals have ultimate control over their homes. MYTH: If there isn't an SLS agency that will serve a consumer, that consumer will not be able to use Supported Living Services. FACT: While there is certainly a shortage of experienced SLS providers, and a great demand for the service, there are other options. Single household SLS vendors (sometimes referred to as individual vendors) are individuals who elect to take on the responsibilities and duties of the SLS provider for one household only. Most often, this type of provider is a parent, adult sibling, friend of the person or other advocate who is willing and able to meet the demands and responsibilities of acting as the provider of services (and employer of record) for a loved one or friend with developmental disabilities. Of course, as with other providers, the person using SLS must decide or agree that he/she wants the other person to be the vendor for the services. People receiving support may also be their own SLS providers. Often, the circle of support is instrumental in assisting the consumer to access the necessary resources in order to achieve this goal. Being ones own SLS vendor, or the SLS vendor for a loved one or friend, is a challenging and time-consuming task, and anyone contemplating this decision should not enter into it lightly. However, when the proper planning and supports are implemented, and the SLS provider understands and accepts the scope of responsibility and work involved, this can be an excellent and cost-effective option for many people who otherwise would not have access to SLS.